Back in the 1980's, when I worked in a 400-person architectural firm in Atlanta, Ga., I had a mentor who was a professor of architectural design. One of the benefits of the company was that, once a month, there was an educational luncheon that was held for the benefit of the young interns who were coming up through the ranks. I particularly remember one lesson from my mentor who showed us slides of his past designs. He noted that, in several of his unbuilt projects, there was a reoccurring theme of a particular element. In one iteration after another, the element kept showing up in one form or another. His advice to us was that, if we had an idea that we thought was valuable, it will keep showing up in our designs and would eventually get built. Thus, it was that my idea of a "house as a leaf" reappeared. 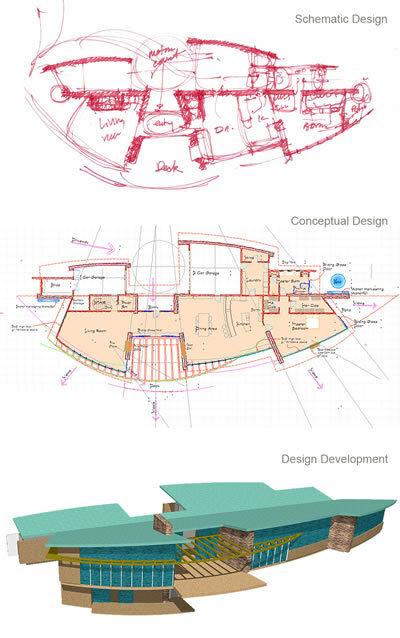 As published in the international magazine, "Architecture+" in May of 2004, the concepts of a "House as a Leaf" were first embodied in the MacMillian Residence. The driving idea behind the design originated for the observation of the way a rain drop would fall off of the tip of the leaf of a ficus plant. The small, almond shaped leaves, with a crease down the center, naturally direct the water to the tip of the leaf. Picking up on this cue from nature, I was able to extrapolate that pattern into the shape of the roof of the house, thereby enabling the roof to harvest all of the precious water into a collection basin. In addition, the folded leaf enables the sun to penetrate deep into the house in the winter, while providing shade in the summer. It also allows photovoltaic panels to be mounted on the north wing of the house to generate electricity, as well as solar hydronic panels, to heat water. The design for the MacMillian Residence was never built. A few years later though, the leaf design "morphed" into a butterfly with the design and construction of the James Learning Center at the Highlands Center for Natural History, just outside of Prescott, near Lynx Lake. Incorporating all of the advantages of the leaf design, the butterfly wings became the sheltering canopy under which the James Learning Center went on to achieve a LEED Gold Certification. In the process of thinking about my own house, the same attributes kept showing up again. A "V" shaped roof, with solar panels on the north side, deep sun penetration in the winter, and water harvesting built into the inherent nature of the design were all evident in every ineration. The "V" shaped roof even appeared in the design of the Visitors Center for the Hagerman National Wildlife Refuge outside of Sherman, Texas, although for a completely different reason, that being a desire to emulate the wings of the thousands of migratory birds for which the Refuge is noted. It was not until recently, however, that I have had a chance to completely revisit the original leaf design, having been approached by a client who noticed the design and had an excellent piece of property which was an appropriate fit for it. The "wings" of the butterfly design have been moved further apart, and thus the design has now been dubbed the "Dragonfly". On the dragonfly design, the rooms such as the garages and wine "cellar" have been nestled into the hill on the north side. The living spaces, such as the bedroom, kitchen, dining room and living room, take advantage of the expansive views to the south. Once again, the photovoltaic array is on the north side, giving the panels unobstructed access to the sun, while hiding them from view. And, like the original ficus leaf, the water that is collected from the roof "drips" off of the end, so that each precious drop of water is harvested for future use in this high desert climate of ours in Prescott, Ariz.